If you use Gravity Forms for your WordPress blog, then you're going to love this integration. With ConvertKit + Gravity Forms you can subscribe anyone who fills out a Gravity Form to a Form in ConvertKit. Here is a link to download the Gravity Forms plugin. Once you install and activate the plugin, you can add a feed to any ConvertKit Form. Let's get started with showing you how to set this up. When you go to your WordPress dashboard, click on Forms to view a list of Forms. Hover your mouse over the Form you want to integrate with ConvertKit and press Edit. On the Edit tab finish setting up the Form's fields then hover over Settings and press ConvertKit. Next to ConvertKit Feeds press the Add New button to add a feed. On the Feed Settings page fill out the Name field to add a Name that will identify this feed. Next choose a ConvertKit Form from the dropdown. Form submissions will be subscribed to the selected ConvertKit Form. Finally, map the ConvertKit Fields to Form Fields. Email and Name are required by ConvertKit for all subscriptions. In the Form Field column select the Gravity Form field that will contain the Email and Name. NOTE: The ConvertKit Name field can take either full name or first name. In the screen shot below, the account has a custom field set for Last Name. Custom Fields will be explained next. Press Update Settings and you're all done! Each submission to this Gravity Form will be subscribed to your ConvertKit Form. The dropdown underneath the Name field will contain a list of the Custom Fields defined on your ConvertKit Account. 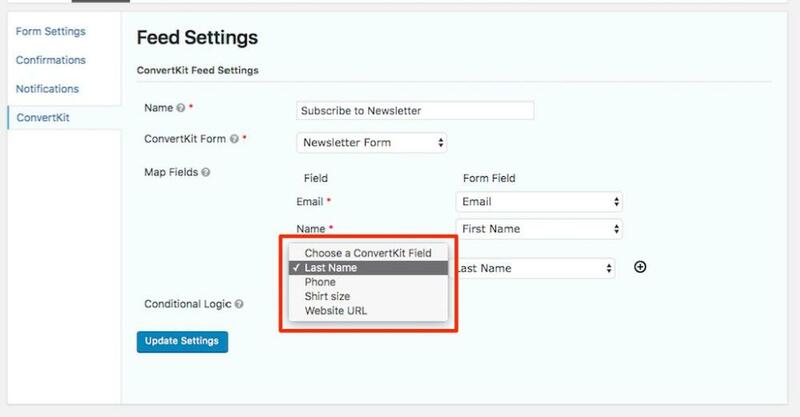 Use the dropdown to map the ConvertKit custom field to a Gravity Form field. If you have more than one custom field that needs to be mapped, press the plus ⊕ icon on the right hand side of the Form to add a row. In the example below we have four custom fields mapped to four corresponding Gravity Forms fields. 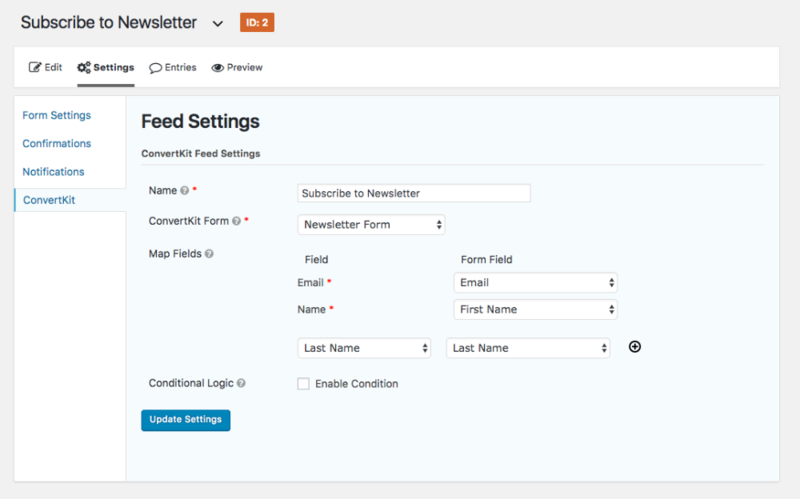 These fields will show on the Subscriber detail page in your ConvertKit account. Gravity Forms provides a feature called Conditional Logic. The conditional logic lets site administrators set a condition that must be satisfied before the Form feed is processed. 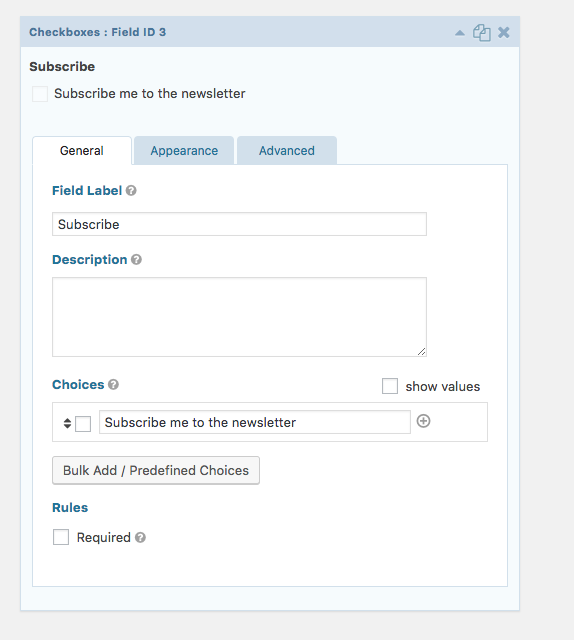 In the example below, we will add a checkbox to a Form that will ask visitors to opt-in to a newsletter. On the Form Editor, we'll add a simple checkbox. 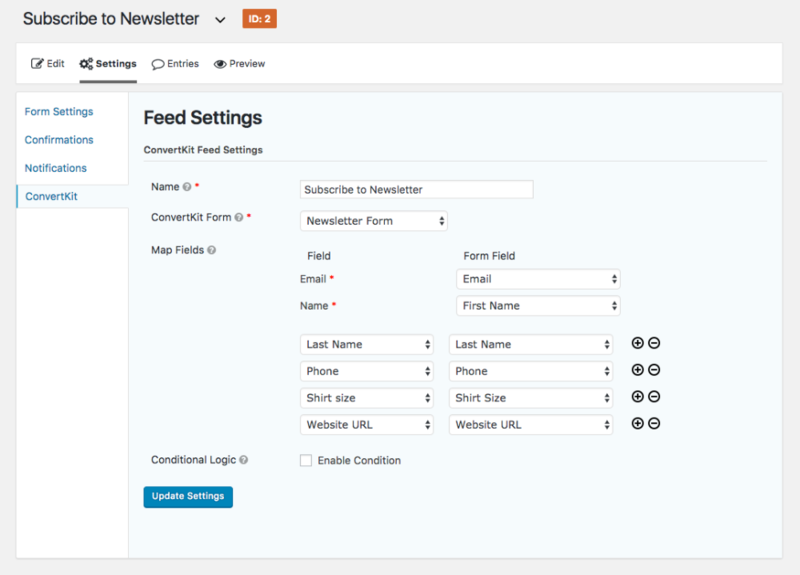 Next, check the box labeled Enable Condition in the Feed Settings for ConvertKit. Set the condition to be matched to Subscribe → is → "Subscribe me to the newsletter"
Now submissions to this Form will only be sent to ConvertKit if the checkbox is checked. That's it! When people sign up to your Gravity Form, the data for the custom fields they fill out will be added to their Subscriber Profile in ConvertKit.